Dr. Todd, Marissa, and Debbie opened On Point Animal Hospital in 2013. From the start, our goal was to open a family owned veterinary hospital that could focus on pets and their owners; we love making friends, not clients. Your pets are treasured members of your family and deserve to be treated as such. We also strive to be a cutting edge practice. In 2014 we were proud to bring Dr. Meg Smith, followed with Dr. Rustin Bodiker, Dr. Renee Wimpee, and Dr. Amanda Hughes and Dr. Thada Davis in 2017. The doctors and staff are very knowledgable and experienced at keeping your pets healthy. We don't just treat sick patients, we promote healthy pets. 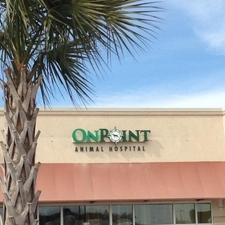 We are proud to annouce the opening of On Point Animal Hosptial Surfside. We are happy to offer quality veterinary medicine to both North Myrtle Beach and now the Surfside beach areas.